Colour theory can be a complicated thing. This is my attempt to simplify it. We’ll be venturing into colour psychology today! I always loved colour psychology for the main fact that people don’t know why they like a colour, nor are they aware of the fact that certain colours can have a calming effect on them. Did you know that certain colours are associated with serenity, opulence and even stimulating the nervous system*? What we perceive the colours to be are subjective. The meanings are also affected by our culture. But, there are some colours which have a more universal meaning. For instance colours which are in the blue range of the colour spectrum (my favourite colours are there) are considered cool colours. These colours have been described as peaceful, but they can also bring about feelings of indifference and sadness. Blue, purple and green are the colours which fall on this side of the spectrum. Obviously on the red side would be the warm colours such as the reds, oranges and yellows which give the sensation of warmth and can generate anger and hostility. There are actually those who use colour to heal, I kid you not, look up chromo therapy if you don’t believe me. But we’re not therapists, we’re designers. So let’s get down to business, this business of colour. I decided to begin with yellow because, well, I found the facts connected with this colour to be interesting to say the least. 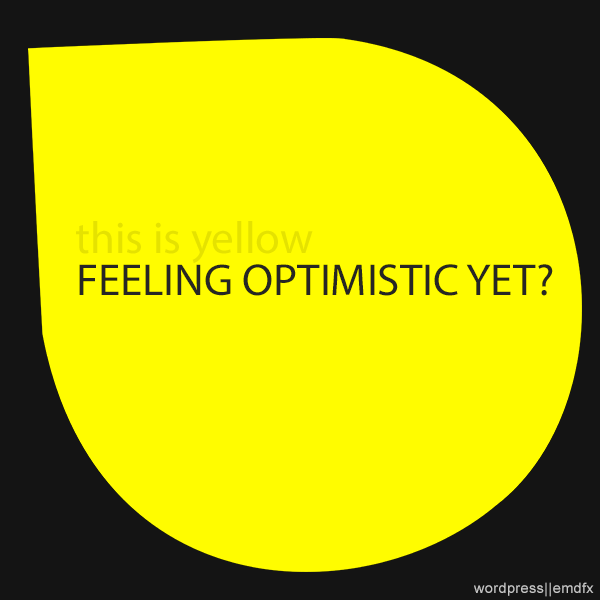 The colour yellow represents optimism, enlightenment (possibly associated with the sun) and happiness. In fact, that rich golden yellow will instill in one the promise of a positive future. Yellow naturally stands out amongst other colours and will give a design energy and optimism. It’s also said to inspire creative thoughts; maybe it should be the colour of your office. That’s it for this week. Next week we will be tackling Red and Orange, the other warm colours. NB: *If that turns out not to be true, don’t blame me…blame the science persons!